First CS300 Readies to Fly in Early 2015! Home Airlines First Bombardier CS300 Readies to Fly in Early 2015! First Bombardier CS300 Readies to Fly in Early 2015! 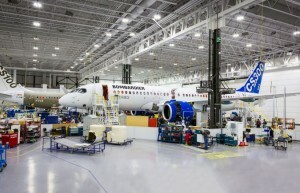 Bombardier announced today that the first CS300 aircraft will make its inaugural flight in early 2015 following the completion of functional test procedures (FTPs) and required engine and taxi runs in Mirabel, Québec. The CS300 aircraft’s entry-into-service (EIS) is expected to occur approximately six months after the CS100aircraft’s EIS, currently slated for second half of 2015.